Taylor Communications is a premier communications solutions provider, with the most diverse printing capabilities in North America. This is your gateway to tools designed to enhance communication and improve your business process. Forgot Username or Password? Register Now. A great choice for many of your personalized business communication needs. No matter the occasion, we offer you the highest quality cards at incredible savings. We can be your one source for all of your kitting, fulfillment, distribution and warehousing needs. Our experienced team is committed to executing all of your kitting and fulfillment requirements. Our mission is to provide customers with peace of mind knowing that every job – big or small, complex or easy – will be done right, every time. Laying the Groundwork for Print Perfection. Successful projects start before the ink ever hits the page. From design, brand compliance and proofing to file prep, output and disaster recovery — our premedia services add value to your overall print program. You can also rely on a dedicated Premedia Technician to help you reduce costs, streamline workflow and avoid costly production errors. It’s your vision — we bring it to life. Taylor Communications is committed to being your brand partner and preferred print resource. 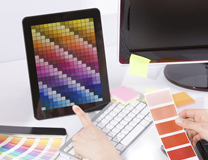 We offer new and better ways to make an impression in print, online and on products. Let's work together to help grow your business.